Apricot Facts, an information sheet for kids cooking activities. Apricot facts and general information about apricots. Apricots grow on trees like apples and peaches. Pick apricots that are soft but not too mushy. Soft means they are ripe and should be eaten right away. If they are a little harder they can ripen at home. Apricots should be golden orange in color. Store them in the refrigerator when they are ripe. 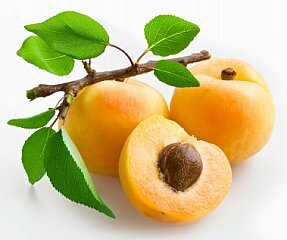 Eat apricots as is, in fruit dishes as you would peaches, make a sauce for meat dishes, or apricots taste great dried. Apricots contain Vitamin A and Vitamin C. They also are a great source of beta- carotene. Apricots are also great fiber and potassium. Apricots also have a high level of carotenoids which help lower bad cholesterol levels. Place pork in a roasting pan. Bake, uncovered, at 450 degrees for 30-35 minutes or until a meat thermometer reads 160 degrees. You can also cook in the crock pot on low for 6 hours or high for 4-6 hours. Meanwhile, in a saucepan, combine apricots, lemon juice, ketchup, broth, honey, soy sauce and ginger. Cook and stir until heated through. Slice the pork and serve with the apricot sauce. Do you have a food facts or recipe to share?